AntiDUSTtape is made of a strong non-woven material which is designed to adapt without difficulty to the expansion and contraction of multiwall sheets. AntiDUSTtape keeps multiwall sheets crystal clear. Correct moisture control in the channels of the multiwall sheet is essential for guaranteeing the transparency or translucency and long life of the panels. Moisture condenses in the channels of the multiwall panels due to differences in exterior and interior temperature. If this moisture is not removed, it will lead to the growth of algae and mold. Leaving the channels open may seem like a practical solution, but it does not prevent dust and insects, from entering the channels, which greatly reduces the crystal clarity! Simply installing an aluminum or plastic profile to the edges of the panels without using AntiDUSTtape will not be enough protection against impurities. AntiDUSTtape, a patented product, guarantees the ideal level of cleanliness and condensation control in the channels of the multiwall sheets. In addition, since AntiDUSTtape is made of strong non-woven materials and is backed with a specially modified acrylic adhesive, it adjusts without difficulty to the natural expansion and contraction of the multiwall sheet. AntiDUSTtape is available in two types and several widths, perfect for a number of applications (see specifications). A recommended tape, for example, for the top edge of panels used in roofing applications is AntiDUSTtape G3600 series, an impermeable sealing tape with no filter or perforations. For the bottom edge, AntiDUSTtape AD3400 series filter tape is used, providing venting perforations which are covered by a modified filter to prevent environmental contaminants from entering while allowing condensation within the multiwall panels to drain out. The special pore size of the filter ensures the continuous removal of condensation. The filter has a durable fungicidal coating which prevents it from becoming clogged by the growth of algae and mold. Classic AntiDUST® breather tape AD3400 series with its built in biocide continues to offer satisfaction and high performance in the most demanding environments. This filter tape has proven itself over the last 30 years. With rapid draining features and resistance to ingression by dust, algae, fungicide, and insects this product remains one of the most effective and utilized protection for both standard and critical applications. The AD3400, in combination with the G3600, is used in many major public and private buildings around the globe. It quietly protects and prevents problems in canopies and walkways the world over! On the domestic front, AntiDUST® tape has served the conservatory, summer room and pool cover sectors for years keeping customers satisfied with it’s ability to drain, maintain and protect the optical clarity of the multiwall sheets throughout their guarantee period and beyond. 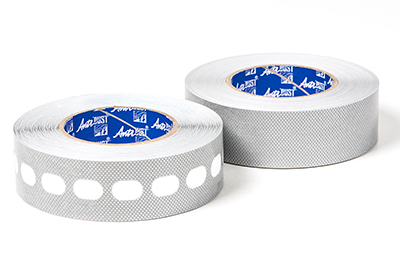 We offer the AD3400 filter tape in different standard widths and lengths. As architects become more and more ambitious with multiwall projects and demands for lower pitched roofs increase we have responded accordingly. As you may know, lower pitch roofs can struggle to drain condensation effectively and as such they need a breather tape that offers the best possible exit for moisture. Especially for lower pitch polycarbonate roofs we have developed a full-width filter tape with advanced capillary action which is available for use in those challenging projects. With our filter tape, your projects will keep up its appearances! In short, the AD4500 AntiDUST offers all the benefits of our AD3400 series, but with the added advantage of full-width, drainage to help the performance on condensate evacuation especially for the lower pitch polycarbonate sheets. 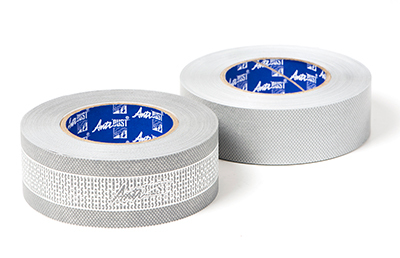 We offer the AD4500 AntiDust tape in different standard widths and lengths. Our AD3400 and AD4500 filter series do their finest work in conjunction with our G3600 blanking tape. This combination gives the best benefits in protecting your multiwall sheets against moss, insects, and algae. The unique construction of our filter tape and closed tape works in harmony with the physical properties of the sheets. High and low-temperature variations have hardly any effect on the characteristics of the tape. The tape also has good resistance to moisture. It conforms well to irregular contours and is therefore well suited for sealing applications. Both products perform in unison with the polycarbonate sheets during periods of rapid expansion and contraction in diverse weather conditions and they offer genuine advantages to everyone associated with this dynamic building material. When properly applied the combination of G3600 with AD3400 or AD4500 will give you the guarantee of a clean and clear sheet throughout its guarantee period and beyond. We offer the G3600 in different standard widths and lengths. Top Edge Sealing Tape Type No. Bottom Edge AntiDUST/Filter Tape Type No.